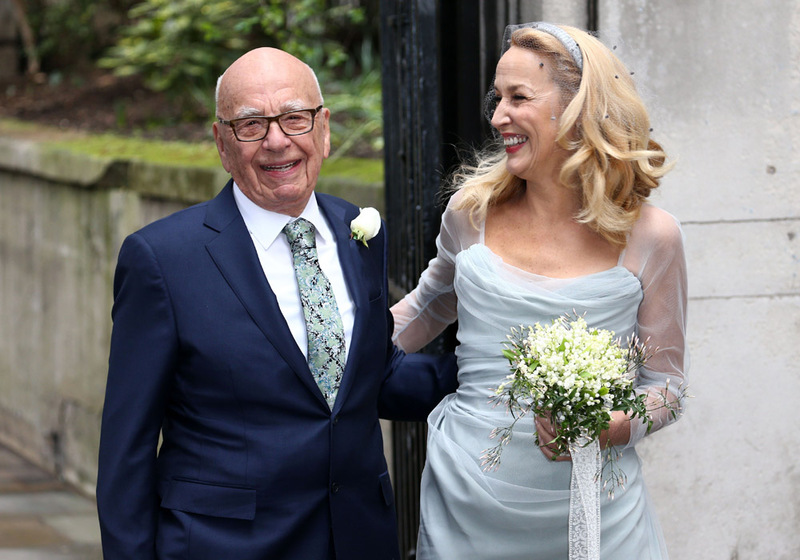 Supermodel Jerry Hall married media overlord Rupert Murdoch at the weekend, in an actually quite magical winter wedding ceremony at St Bride’s church on Fleet Street. Guests from Bianca Jagger to Bob Geldof turned out to celebrate with the couple, who got engaged in January after a whirlwind four month romance, and Jerry’s daughters Georgia May and Lizzy Jagger were her celebrity bridesmaids in blue. 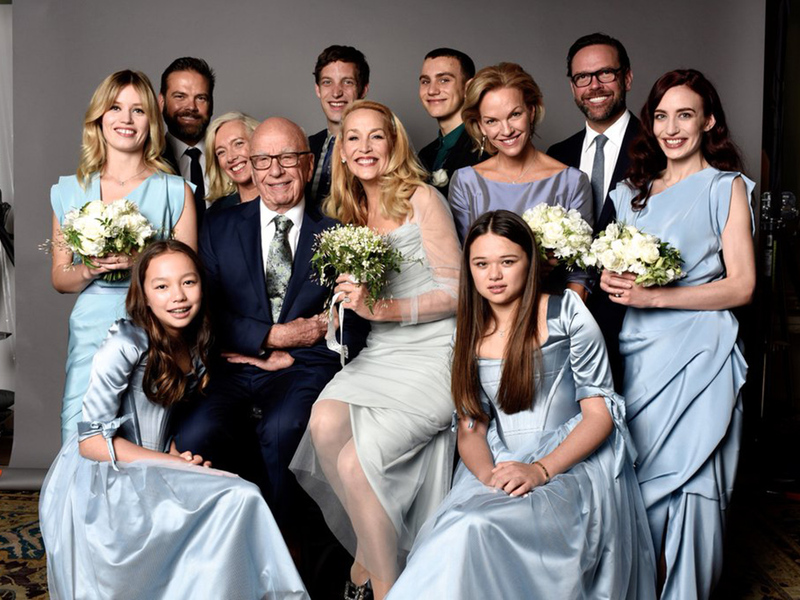 Update 14/03/2016: Jerry Hall posts the first official photo of the wedding on Twitter ‘My beautiful family!’ shot by David Bailey. So, crucially, let’s talk wedding dresses. What was Jerry’s like? Well the bride wore Vivienne Westwood and, knowing that whatever she chose to wear would make front pages around the world, it was a safe and stylish bet to place. Dame Vivienne, famous for her hyper-womanly draping and attention to fit, delivered a beautiful confection for her friend – Jerry has walked in several Westwood catwalk shows over the years and her daughter Lizzy Jagger even made her modelling debut on Vivienne’s catwalk at the age of just 14. The upper half of the dress was goddess-like, with bias cut chiffon pulled elegantly around the bust and wrapped into soft sleeves. Below the knee, things got a little more crumpled – the fine chiffon clashed a little with the white tinted tights in an unintentional Frozen tribute – but we loved the asymmetry of it all. The other key question to tackle – should Jerry, 59, wear white? It is, technically, her first official marriage – she married Sir Mick Jagger in 1990, but he later annulled the Hindu stating that it was not legally binding. We think she could have totally pulled ivory off, but instead she played safe with an ice blue hue, that really complemented her colouring. Her accessories, too, were oh so good– Roger Vivier silver shoes and a white Chanel minibag for starters. Jerry topped off the look, not with a lengthy veil, but a coordinating ice headband with a light net attached. The bridesmaids also wore Westwood – a sturdier satin version of their mother’s wedding dress, teamed with sparkly Aquazurra shoes.